What's the best use of video for an interview you've seen? And don't forget to check out this week's Rewind featuring the New Haven Register's other standout videos from last week. Whether we're talking factless works of fiction or Pulitzer Prize-winning journalism, a writer needs to illustrate the story. And in this digital age of multi-channel storytelling, it's important for every online news organization to show their stories in as many ways as possible. This is at the heart of my love affair with Google Maps. Especially when we're talking about local journalism. People like to see where the news around them is happening. It's also great for filling out space on breaking news stories that may not have much more information than a location yet available. In about a minute (seriously, it's not that difficult), you can add an interactive map to any online story and show your "where." 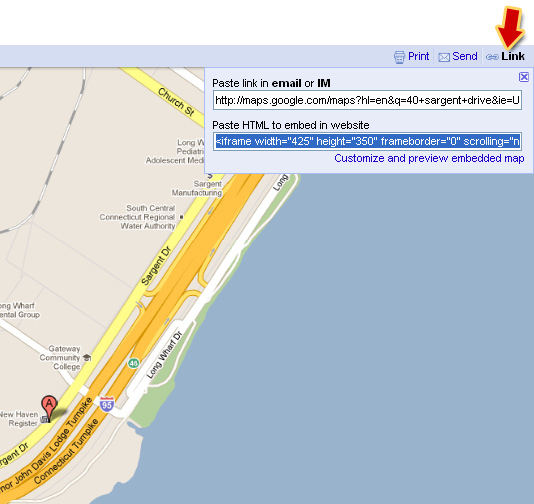 Google an address, grab the embed code, paste it into your web-publisher, voila. We've been taking advantage of this at NewHavenRegister.com quite a bit recently. Every time I catch a story that has a location I can pinpoint on a map, I add it to the story. That is of course, if it makes sense to show the location. For example, if you are working on a story about a man who was arrested for stealing a vanilla ice cream cone from a kid - you want to show where this crime occurred on a map. But if the only "where" info you have is the man's address -- as some blotter stories do -- there is often little reason to map that. Don't map just to map. Map information that has context in the story you're telling. VS ONLINE METRICS: Should reporters care about what their readers are reading - and not reading? You know what's better than producing solid, electrifyingly good content for your newsroom? Validation. Proof that readers are interested in your supposedly electrifying content. For the past year or so, the New Haven Register newsroom has incorporated video into their storytelling and reporting. Many of them now shoot, edit and publish their own video content without any 'computer guys' (which apparently I am?) in the room. They have all honed their skills, and found varying degrees of comfort with it. Which is a fairly compelling story, since many across Journal Register Company had never even held a video camera before being handed their own FLIP cam last year to use as a reporting tool.